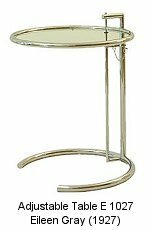 Whereas the more decorative forms of Art Nouveau evolved into Art Deco, the cleaner, more "form-should-follow-function" streams developed into the various streams of European Modernism, which in turn became the International Style. 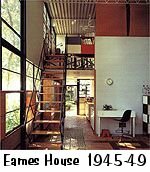 Bauhaus in particular led directly into the International Style, not just stylistically but also physically - most of the designers from the Bauhaus moved to the US and continued to develop in an increasingly generic, minimalist way. 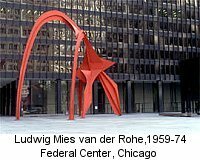 The first exhibition in which the term was first used was in 1932 at the Museum of Modern Art in New York. 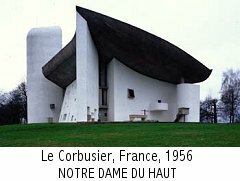 "The International Style" Exhibition consisted of photographs of buildings from around the world - white, minimalist structures with flat rooves, large sheet-glass windows, clean lines and shining, functional chrome fittings. International Style designers shunned unnecessary embellishment. If it didn't serve a purpose, it was gone. 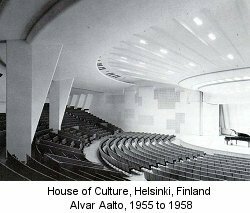 This 'machine aesthetic', although looking superficially like some aspects of Art Deco, was philosophically at the other end of the spectrum. 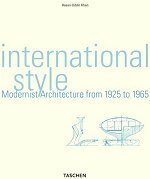 While Deco revelled in aecleticism, the latest fads and fashions, the International Style was seen as pure - in pursuit of perfect forms. 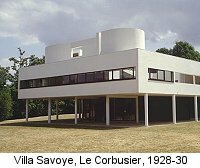 Definition of International Style: A 20th-century style of architecture and design marked by its almost austere geometric simplicity. 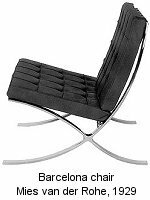 Remember this chair from the Bauhaus? 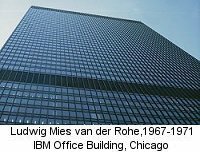 After migrating to the US, Bauhaus Director Mies van der Rohe is said to be the founder of the International Style. 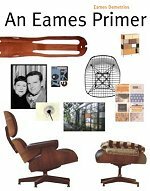 Husband and Wife design super-duo, they defined a style now called "Eames Era". 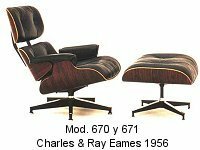 From buildings to chairs to lamps to exhibitions - the range of designs by the Eames is diverse and prolific. They even became film-makers in their later years. 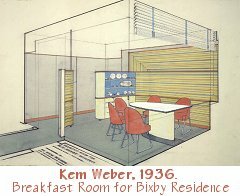 One of the first 'Moderne' designers in the US, German-born Weber followed the principles of the Machine Aesthetic. Born Karl Emanuel Martin Weber, he shortened his name to Kem (perhaps to sound less German) when he moved to the US during WWI. 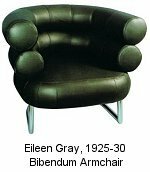 An enigmatic and original designer and architect whose wide variety of styles throughout her career varied from ornate lacquered pieces in her early work to stark, minimalist furniture that epitomised the International Style. 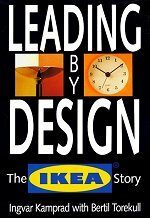 Finnish architect and designer. 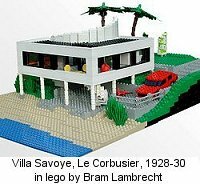 His early work was influenced by neoclassism, but then he later adapted the symbolism and functionalism of European Modernism. 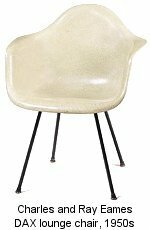 Some of his chair designs have become classics, and are still produced today. 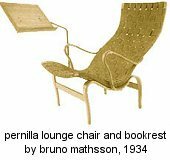 Designer of the famous "Grasshopper Chair"
WWII had led to shortages of materials in many countries. Rising Internationalism cause by television & other forms of media, as well as improved long-distance travel and freight.